Important things to consider before shooting an old handgun include the quality of the gun, the pressures generated by the gun’s chambering, and the type of bullet to be fired. I received a letter from a gentleman asking about ammo for an heirloom revolver. It was a Smith & Wesson M&P revolver in excellent condition that, per the maker, was made before the First World War. I enjoy fine old handguns—many that I shoot are much older than I am—so the reader’s letter raised some good points about prudent practices. Although the “trigger” for this column is about ammo, I cannot ignore the hardware. Never hesitate to have the firearm checked out by a professional knowledgeable of that make and model. Then consider who made the firearm. 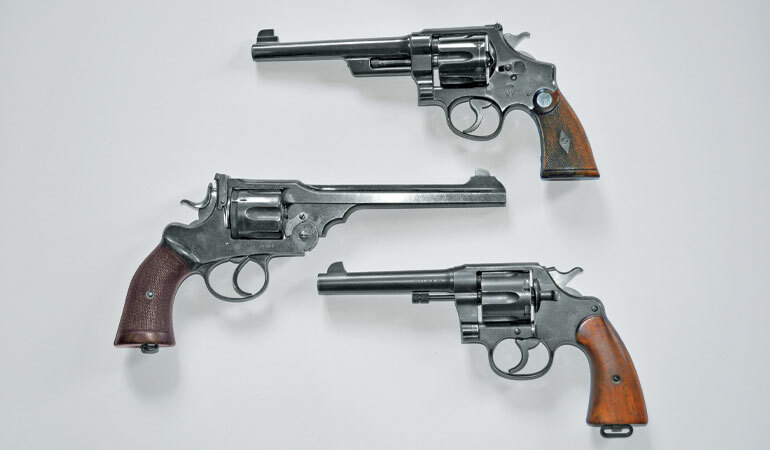 Prior to World War II, Colt and Smith & Wesson were the quality leaders in American revolvers. Unlike today, there was a massive gap between their quality and the next tier of makers. Occupying the dead-last position were imports that crudely copied famous American revolvers and were the output of cottage industries. Some lacked even basic caliber markings. We had one in the Crime Lab collection whose only caliber information was, in slightly broken English, “Use the American cartridges that fits best the CH revolver.” Avoid these guns. I look cautiously on shooting old American break-top revolvers, even when they were made from a quality maker. The typical U.S. break-top latch was workable when new but loosened quickly with wear. On the other hand, the robust strap-style latches used on British Webley break-tops cause me no heartburn at all. I still shoot my .455 Webley-Green Target that was likely made before 1905. The reader who wrote to me was concerned about modern .38 Special pressures. He said he wanted to create some light handloads using jacketed bullets. I told him I was less concerned about pressures than about lightly loaded jacketed-bullet ammo. The current maximum average pressure (MAP) standard for .38 Special is 17,000 psi. Most factory ammo is held at or under 16,000 psi. I feel comfortable that factory ammo that is not +P is safe for .38 Special revolvers that were made after 1900 by quality makers. That assumes the revolvers are in known-good condition; the pressure assignment system considers older guns but not abused guns. The .38 Special +P has a MAP of 20,000 psi; I cannot recommend it for older revolvers. The problem with jacketed revolver bullets and old revolvers is fit. The cylinder throat dimensions for most revolver cartridges developed before World War II were based on firing oversized, soft-lead bullets with dished or hollow bases. Some .38 Special cylinder throats can be larger than 0.360 inch. On firing factory lead bullets, expanding gases push into the hollow portion and expand it to positively seal the gas behind the bullet while still in the cylinder throat, just like piston rings in a car engine. Without this tight fit, the gas leaks around the bullet, reducing the energy available to keep the bullet moving into the barrel. No jacketed bullet is going to expand and seal at the modest pressures of the .32 S&W Long, .38 Special, .44 Special, or .45 Colt. In addition, jacketed bullets are “dry”—no lube. They need more pressure, not less, to safely traverse the bore. The soft, dished-base lead bullet seems virtually exclusive to factory ammo. If you buy or cast bullets to handload, most designs are flatbase and are often alloyed much harder than factory fodder; they seldom upset enough at modest pressures. Factory lead bullets are between 0.75 percent and 3.0 percent antimony, the only hardening agent normally present. Softer, expanding-base bullets also create the best seal in worn barrel throats and help with oversize barrel/cylinder gaps. Consider the type of bullet to be fired. Generally speaking, soft lead bullets with dished or hollow bases in non-+P ammunition are recommended for older revolvers. As much as I love handloading, I believe the average low-volume user of an older S&W or Colt revolver will do best with major-brand, non-+P factory ammo with either a full-weight roundnose lead bullet or, in the case of the .38 Special, 148-grain hollowbase wadcutters. Neither style is terribly expensive and will be easy on the revolver and its shooter. This approach no longer works for one popular class of old revolvers. Colt and S&W Model 1917 ex-service revolvers were designed in a hurry to shoot the .45 ACP cartridge with 0.4505-inch jacketed bullets, but their cylinder throats are seldom tighter than 0.454 inch. Factory-loaded .45 Auto Rim ammo with a 230-grain dished-base lead bullet was perfect, but its only maker, Remington, no longer catalogs it. Before shooting jacketed ammo, make sure the barrel/cylinder gap is 0.008 inch or smaller and shoot slowly enough to hear “off sounds” that could indicate a bullet lodged in the bore. I handload my Model 1917 Colts with 0.454-inch cast SWC bullets and stick to bullet weights of 230 grains and heavier. Pre-1940 centerfire semiautos offer more “good” brands. S&W made few semiautos then, but Colt, Savage, and Remington did, and their quality was high. Some imports were well made, like Brownings from Belgium; Lugers, Mausers, and Walthers from Germany; Berettas from Italy; and the Astra 300/400/600 series from Spain. The biggest issue with semiautos is often feeding. 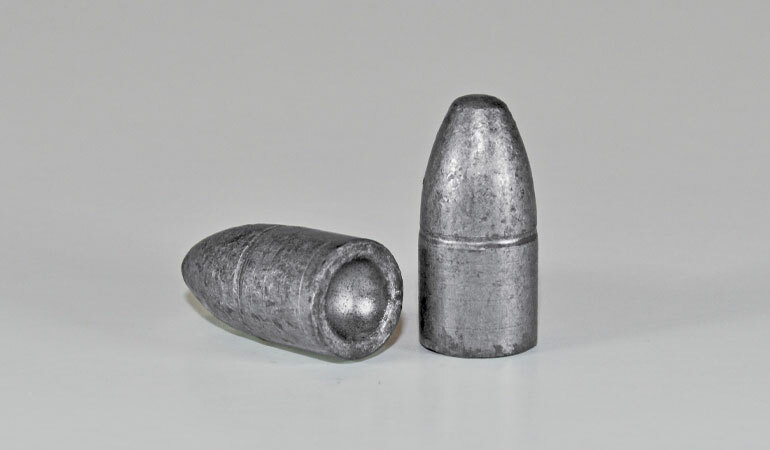 Bullet shapes other than the FMJ-RN were virtually unknown in pistol ammo before the 1960s, and the pistols were not designed to feed the more aggressive nose shapes we enjoy today. It behooves you to stick with traditional FMJ-RN ammo in these. The other issue is underpowered ammo. At the time these pistols were made, you could find European ammo loaded to higher velocity or with heavier bullets than U.S. ammo. If cycling seems weak with one brand/type of ammo, try another. With 9mm Luger, try 124-grain bullets should 115-grain loads prove sluggish. Subsonic 9mm Luger ammo seldom works well in the older guns we are discussing. Even should your old veteran feed modern 9mm Luger bullet styles, avoid those loaded with bullets lighter than 115 grains. Bullets in the 90- to 100-grain range are commonly loaded over 1,300 fps and can create higher slide velocities that an old pistol may not tolerate. If you are handloading for your old semiauto, the last semiauto consideration is cartridge overall length (COL). Use COLs matched to factory FMJ-RN loads.